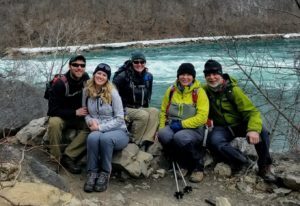 Mild spring temperatures and sunny personalities provided for a wonderful hike along the mighty Niagara River. 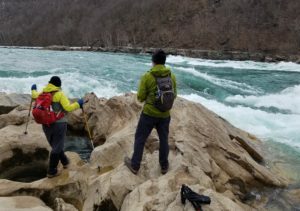 We descended the newly refurbished stone steps at Devil’s Hole State Park and hiked along the river past the giant ‘Rock of Ages’ boulder, and to the iconic Flat Stone area to observe the surreal rapids and waves. Some new rock slides made trail trekking more adventurous, but our ADK group was unfazed by the challenge. Nature provided fascinating snow and ice sculptures from the tail end of winter that were an artistic feast for the senses. 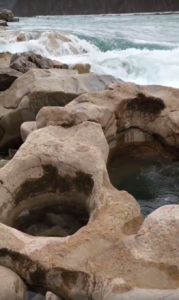 Potholes filled with water and ice hinted at their amazing formation process. Hike leader Beth Hartz was elated to announce her engagement to longtime partner Ted, and they pointed out the spot along the Niagara where Ted proposed. It was a joy to witness their wonderful memory and wish them future happiness.